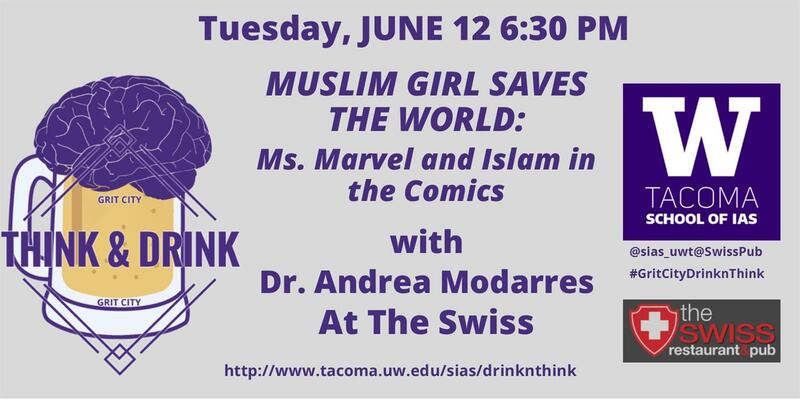 Tuesday, June 12, 2018, 6:30 – 8:30 p.m.
Muslim Girl Saves the World: Ms. Marvel and Islam in the Comics with Dr. Andrea Modarres, UW Tacoma. Superheroes such as Superman or Captain America have been consistently popular, but in response to changing cultural expectations, their ranks are becoming more diverse, with Wonder Woman and Black Panther joining the pantheon of superhuman costumed crime fighters. This talk will examine a very different superhero, the rebooted Ms. Marvel, whose alter ego is the teenaged, Pakistani-American, Muslim Kamala Khan. In juggling the pressures of adolescence, second-generation immigrant identity, and her newly-discovered super powers, this new Ms. Marvel humanizes Islam in a 21st century context and illustrates the influence of representation in popular culture. Andrea Modarres is an Assistant Professor whose research focuses on 20th and 21st century American multiethnic literature and identity in the U.S. She teaches a range of literature courses at UWT, from specialized multiethnic literature, to young adult literature and science fiction, as well as introductions to literature and to American studies.